* 본 제품은 기존 SMARTer® ThruPLEX® Plasma-seq Kit (Code R400490)의 업그레이드 버전 제품이며, indexing primer kit가 포함되어있지 않습니다. SMARTer® ThruPLEX® Plasma-Seq Kit는 혈장 (Plasma) 유래의 cell-free DNA로부터 SMARTer® ThruPLEX 기술을 이용하여 Illumina® NGS Library를 제작하는 제품이다. 본 제품은 기존 제품에 비하여 End repair, ligation 시약 및 반응조건을 최적화하였으며 Plasma DNA로부터 다양성이 보다 높고 GC representation을 보유한 NGS Library를 구축할 수 있다. 제작된 Library는 CNV 분석, Whole Genome Sequencing (WGS) 뿐만 아니라 Custom panel이나 Agilent SureSelect, Roche NimbleGene SeqCap EZ와 같은 Target enrichment platform에 적용 및 분석할 수 있다. 그림 1. Illumina NGS workflow for cfDNA. Blood samples are collected, plasma is isolated, and cfDNA purified. SMARTer ThruPLEX Plasma-Seq library preparation follows and consists of three steps: repair, ligation and amplification. Indexed libraries are purified, quantified, and pooled prior to sequencing on Illumina NGS platforms. 그림 2. SMARTer ThruPLEX Plasma-Seq single-tube library preparation workflow. The workflow consists of three simple steps that take place in the same PCR tube or well and eliminates the need to purify and transfer the sample material. 그림 3. SMARTer ThruPLEX Plasma-Seq technology. A three-step, single-tube reaction that starts with fragmented dsDNA or isolated cfDNA. 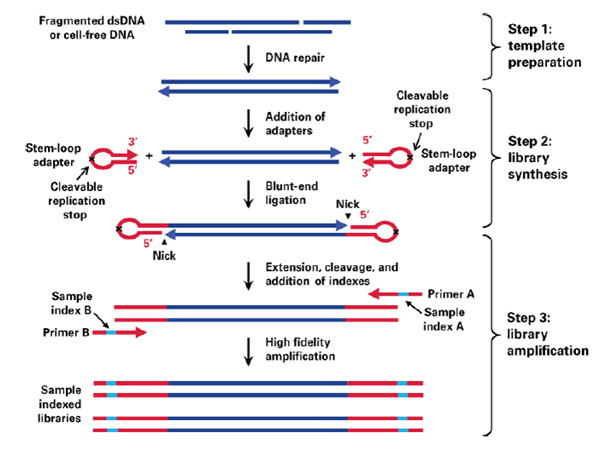 Stem-loop adapters are blunt-end ligated to the repaired input DNA. These molecules are extended, then amplified using a high-fidelity polymerase to yield an indexed Illumina NGS library. KAPA Hyper Prep Kit, NEBNext Ultra DNA Library Prep Kit과 비교하여, SMARTer® ThruPLEX® Plasma-Seq Kit이 보다 뛰어난 성능과 재현성, GC Coverage를 보유하고 있음을 규명하였다 (Technical Note: An optimized solution for cell-free DNA library preparation) (그림 4, 그림5). 그림 4. Diverse, reproducible NGS libraries. Libraries created with the SMARTer ThruPLEX Plasma-Seq Kit yielded more unique molecules (Panel A), fewer duplicate reads (Panel B), and negligible unmapped reads (Panel C). Libraries were sequenced on an Illumina NextSeq 500 as a paired-end run with 17M to 25M reads per library. Duplication rate were calculated after down-sampling the data to 17M reads per library. Representative data from each sample is shown. 그림 5. Reproducible, unbiased GC coverage. 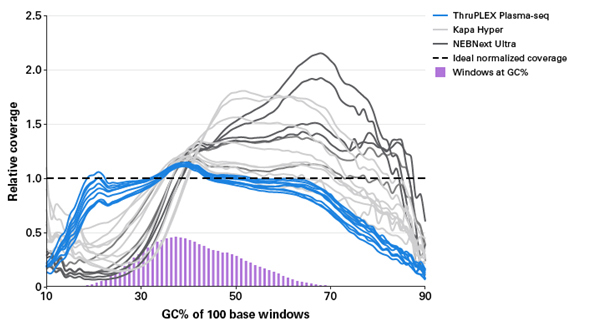 The SMARTer ThruPLEX Plasma-Seq Kit provided the most reproducible and unbiased GC coverage across the human genome, showing minimal variability across the nine plasma samples tested. Libraries were prepared from cfDNA isolated from an equivalent of 1ml of plasma sample and sequenced on an Illumina NextSeq 500. Four separate plasma samples were used to construct the NEBNext Ultra libraries.